A Beautiful Ruckus: The Little Things Thursdays: #23....on Friday! The Little Things Thursdays: #23....on Friday! Yes, I know it's Friday, but I chose to post about my niece, Aubree, instead. So many of you left comments and sent messages saying that you are praying that she survives to birth and through the open heart surgeries ahead of her. My brother, Mike, sent me a message saying that they are beyond encouraged and find the outpouring of support from people that they don't even know to be incredible. Thank you, friends. Thank you so much! So today, we are going to have our Little Things Thursday post that we missed yesterday. Thanks for being flexible with the link-up! Sometimes I forget to take group shots of the kids. I was better about it when they were infants and couldn't wriggle away. It is super difficult to get a picture like this without physically holding them in place. In other words, it's much easier when Sean and I are holding them in the photo. But! I had success with this one! Upside down laundry baskets make great seats! The girls thought they'd relax while sipping on their pre-bedtime milk. There are times when I've wondered if we will ever reach certain milestones. This week, we reached another one! The kids all successfully colored with crayons! They only took one or two bites out of them the whole time. In the past, they've thought the crayons were snacks. Yikes! But this week, we succeeded in coloring! Proud Mama! Of course, I kept their first coloring pages! She loves milk, but doesn't like water. Abby is so goofy! She will check the other kids' cups hoping to find milk in one of them. I snapped this photo right before bedtime. The other kids had set down their cups and headed upstairs to brush their teeth. Abby saw an opportunity and seized it. Since the other cups still had milk in them Abby collected them all. Score! Sean brought these home as a surprise for me! 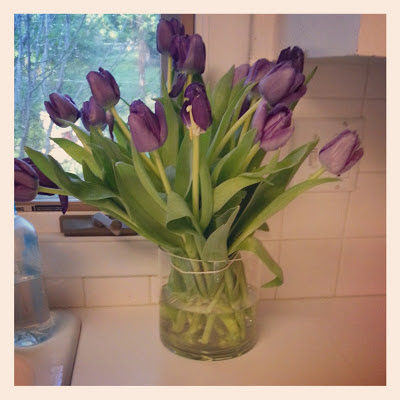 18 purple tulips. So pretty! I love having fresh flowers in the house! I haven't been sleeping well lately. I try to take naps, but those have been sparse this week as well. Today, I had a two hour nap. The kids slept the whole time, so it was two full uninterrupted hours. I feel so much better! And yes, naps are always worth making it onto the Little Things Thursdays list! 8. Lastly, Thank You for Voting for Us! The Top 25 Moms of Multiples Blogging Contest finally ended, and with your help, we won 9th place! In every way, you all support us, and for that, we are truly thankful!